2019 is quickly approaching. Have you been thinking about your growth lately? Do you want greater outcomes for your career or business? Do you need clarity for your personal brand and want to begin the process of developing yours. Do you find it difficult to get out there and network with others even though you know that's what you need to do to grow? Do you simply feel lost as you are trying to figure out your next step in your career or business? If you answered yes to any of these questions, this group training series is for you. Join me, along with a group of like-minded professionals as you spend 7 weeks together, discovering the 7 Laws To Build Your Personal Brand. 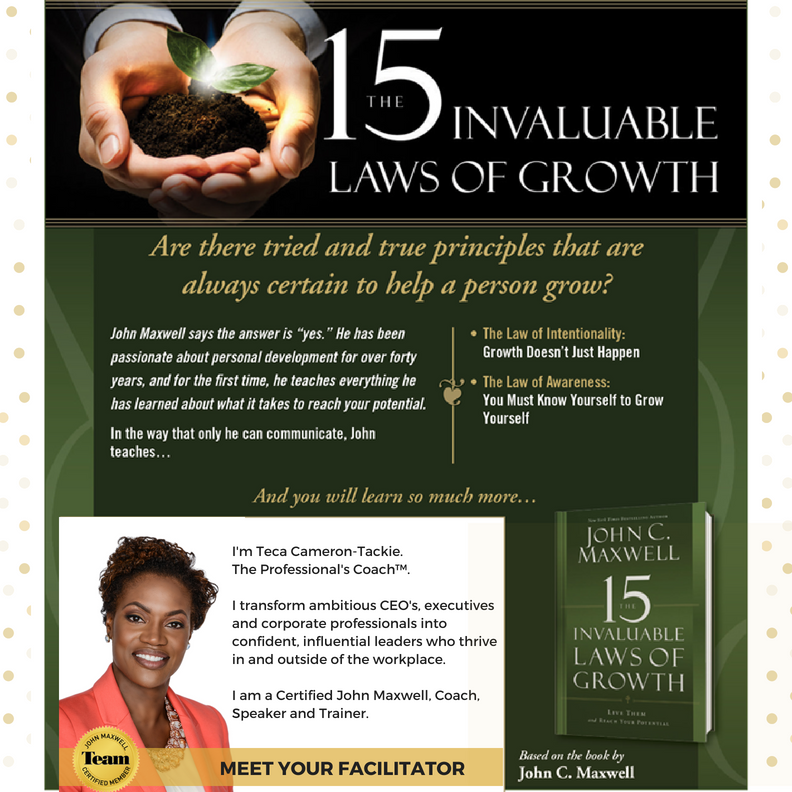 These laws are taken from John C. Maxwell's 15 Invaluable Laws of Growth. Over the 7 week study, you will learn each law in detail and apply it to building your personal brand profile. Building your brand requires looking within to IDENTIFY YOUR PURPOSE, DEVELOP SELF AWARENESS, STRENGTHEN YOUR CONFIDENCE, among other things. The group will meet once per week on a Thursday afternoon to discuss and learn key principles for building a strong personal brand. Come alongside other like-minded ambitious professionals, like yourself, who are also committed to their personal growth. Ready to start building your brand? Click the link below to get signed up. Space is limited so act fast! REGISTRATION IS CLOSED. STAY CONNECTED TO BE INFORMED OF FUTURE SESSIONS. WEEK 1 – Why Are Relationships Important to Success? WEEK 2 – What Do I Need to Know about Others? WEEK 3 – How Can I Encourage Others? Week 5 – How Can I Become a Better Listener? Week 6 – How Can I Build Trust with Others? Week 7– What Is My Most Important Relationship? Week 8– How Can I Serve and Lead People at the Same Time? Tuesdays: February 20th, February 27th, March 6th, March 20th, April 3rd, April 10th, April 17th and April 24th. * Please note the cost of the book is not included in this price. You are encouraged to purchase the book to receive the greatest benefit from this learning series. Books can be purchased at: Details for purchasing the book will be sent when you register.